Trips abroad are more convenient when you don’t have to spend over an hour just trying to connect to a wireless internet in your hotel. The 147th Elite Travel Wireless Router is a small device that you can plug into any socket and use right away. All you need to do is to connect it to your hotel or convention center’s internet service to share that service to your laptop, tablet or any other device you have. If your hotel has a wired network, this device can be your access point. On the other hand, with the Bridge Mode feature the device can allow multiple users to share a single internet connection. Aside from this, it also has dual USB ports to charge other devices such as your smartphone and tablet. This is thanks to the 6000mAh internal battery or built-in power bank that is included in 147th Elite Travel Wireless Router. There is no need to worry about timed connections because all the control is in your hand. Not only is your WiFi hotspot personal, it’s secure too. Those who love to use their smartphone’s 4G and LTE can be shocked by their monthly data plan bill. That is because some mobile companies charge extra fees for tethering or for exceeding the monthly limit. If you constantly need the internet wherever you go, you might want to invest in something better and cheaper. Try a WiFi travel router such as the 147th Elite Travel Wireless Router. This router has received lots of positive reviews, and is sure to make your trips more manageable. If there is one word that sums up what reviewers say about this product, it is ‘perfect’. It is affordable, reliable, and convenient. 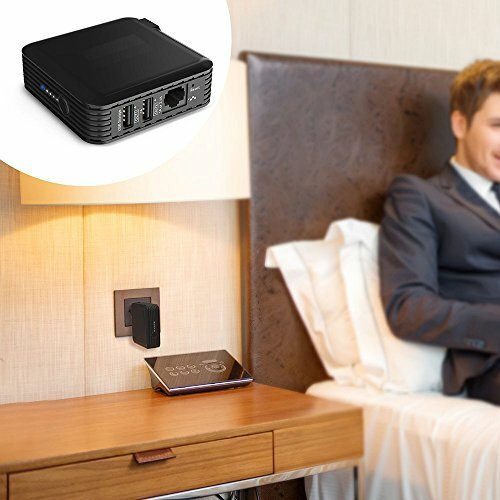 For a reasonable price you will get this compact WiFi router that you can use when staying in a hotel room, allowing you to watch your favorite TV series on any device. You can get help with the setup process from a local pro for an additional cost. Using it as a wireless extender (Bridge Mode) so there will be no dead WiFi spots in your room or within the area. All these functions allow you to wirelessly enjoy browsing, streaming or updating your social media accounts safely and securely. Of course, you can share it with your friends and family too. This little device can do more than you might expect. With its built-in power bank, you can charge multiple devices. In fact, with its dual USB ports, you can charge two devices at once. Though the product has good reviews, it has an obvious limitation. If you are someone who is always on the road, you cannot rely on this device. On its own, you won’t be able to connect to the internet—the hotel you are staying in needs to have a WiFi connection available for customers. Lastly, the device does not guarantee fast internet surfing, as this depends to some extent on the network’s service provider itself. Nevertheless, the 147th Elite Travel Wireless Router is still a traveler’s must have. If you want a more convenient and secure way to surf the internet while you are away from home, this is a good device to invest in.